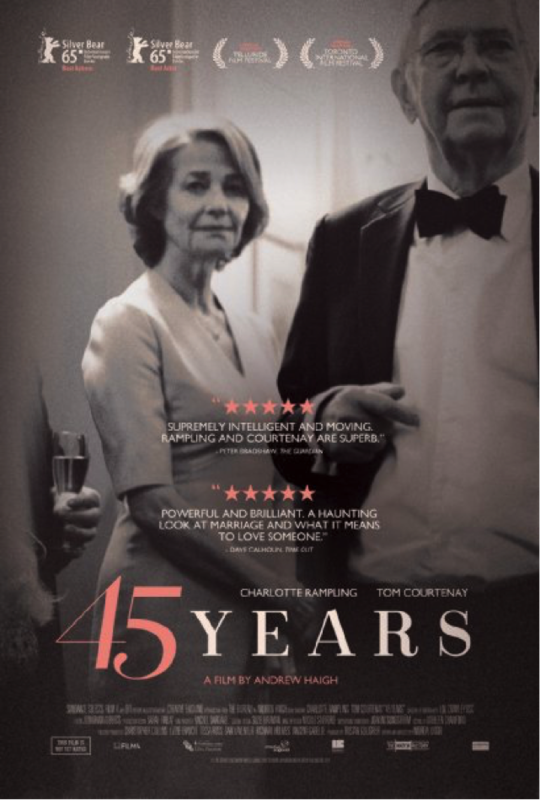 Kate (Charlotte Rampling) and Geoff (Tom Courtenay) are six days away from celebrating their 45th wedding anniversary, when Geoff receives a letter informing him that the corpse of an ex-lover has been finally been found after her tragic fall in the Swiss Alps over fifty years prior. It’s a truly grizzly, melodramatic death for such a quiet film, and in the minutes after the announcement of this plot point, you’d be forgiven for wondering why 45 Years was made into a film in the first place (it is based on a short story by British author David Constantine). The most exciting thing has happened off-screen, over half a century earlier, and although it comes as a shock, and somewhat rumples both Geoff and Kate, the two are the picture of a loving, communicative, and uncomplicated couple. It’s hard to imagine that this discovery could really impact their relationship on any level dramatic enough for film. Unlike the suddenness of the death itself, the impact it has on Geoff is slow and seeping. At first he is pensive and nostalgic, listening to songs of the period and picking up his old habit of smoking, which seems a completely reasonable response from someone drawn back to such a significant event in his life. But as the days draw closer to the anniversary celebration, Geoff becomes more preoccupied, and Kate more concerned. While Geoff’s not completely silent, willingly sharing memories with Kate, there are omissions, and his true feelings moment to moment are disguised, both from Kate and from the audience. Because of this, the film relies heavily on Rampling. Kate is the focal character of the film, and while the audience is supposed to grow more and more uncertain and distant from Geoff, they always have to be aware of Kate’s motives and insecurities, even when she doesn’t have the lines to convey them. It would be easy to ham up Kate, to exaggerate for fears her point of view would not come across, but Rampling is exceptional in her ability to quietly portray her character’s emotions. Each new revelation, and each shift in tone, hits the audience with a thud, because Rampling allows them to feel everything alongside Kate. It is the audience’s closeness to Kate that changes the movie from a frivolous drama, to a distressing, and sometimes disturbing, study of romantic partnership. Which is not to say she is the only source of talent in this film. Courtenay’s Geoff is exactly the character he needs to be—a loving husband going through some kind of life crisis that causes him to distance himself from his wife. Andrew Haigh’s script, too, does a masterful job at revealing information in parcels throughout the film that are just shy of quenching the audience’s thirst. But in the end, it is Rampling’s Kate that stops the film from becoming too soapy to be relatable. A different lead could have completely changed the tone of the film, and made it far less powerful. My one criticism of 45 Years is that it is just so damned white. It is set in one of those provincial British towns, much like something out of Midsomer Murders, with a picturesque countryside full of middle-class white families, creating the sense that everyone in the area is at least distantly related to each other. It could be argued that when the vast majority of dialogue is between two people, there isn’t really a whole lot of room for diversity, but this doesn’t explain why there are absolutely no speaking roles for anyone who isn’t white, nor why the town has to be so devoid of diversity. This may not have been so apparent to me (I’m just as likely to be oblivious to issues of race as your typical privileged white person) if it hadn’t been for Rampling’s comments about the Academy Awards boycott being ‘racist to whites’ and that ‘perhaps the black actors did not deserve to make the final list’. Though she has somewhat backtracked from these comments (she has apologised for her comments being misinterpreted, rather than for the comments themselves), it’s hard to un-ring that bell. In Brandon K. Thorp’s New York Times article, ‘What Does the Academy Value in a Black Performance?’, he states that ‘[a]ll 10 performances for which black women have received best-actress nominations involve poor or lower-income characters’ and that none of them have ‘even [had] a college degree’. Though there are cultural differences between the US and the UK, it does beg the question whether a character like Kate, a retired teacher living on an acreage outside of a small town, would have been as widely accepted by critics if she had been anything other than white. For me, there is no question that Charlotte Rampling deserved her Academy Award nomination for 45 Years. It is a truly exceptional film, and a whole lot of that credit goes to Rampling’s performance. It should also be noted that, with Rampling having turned 70 in February, 45 Years demonstrates why the under-represented stories of older women are so valuable in film. But, though a part of me wants to, I just can’t separate my personal politics from my interpretation of the film. While 45 Years demonstrated the complexities of marriage and relationship identity, its connection to this depressing part of film industry history should make us question how accepting we are of such universal themes when they are performed by someone different from what we are used to. When so much of Western society’s representation of itself is displayed in film, we need to examine whether the image we create of ourselves is really as inclusive and authentic as it can be.